A) SmartBank - "Free 60 day Trial"
Please Click HERE to download the NEW SmartBank Manager (only 3 meg) and a 60 day FREE trial. B) Demo OFC Bank Statement example"
1) Click on "Change Accounting Package" and select "Pastel Accounting"
Yes, SmartBank works on BOTH Pastel Partner and Pastel Xpress packages from Version 2007 to to 2014. 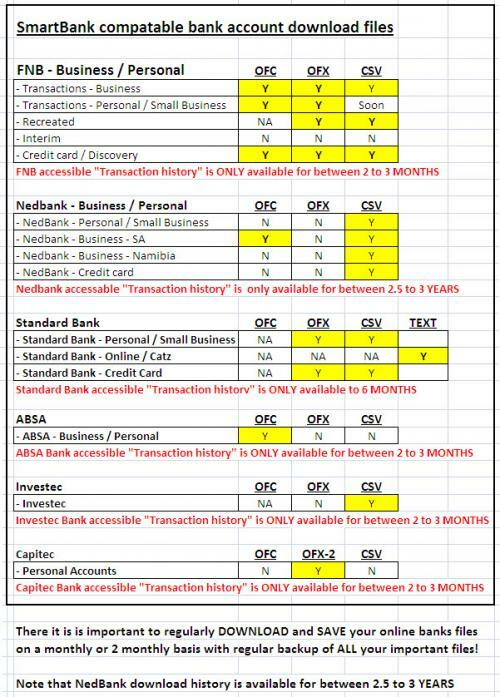 The table below displays the recommended OFX, OFC or CSV Bank statements download files that should be downloaded from various banks. If your bank is not on the above list, just download ALL of the OFC, OFX or CSV files and save them in a folder on your harddrive.